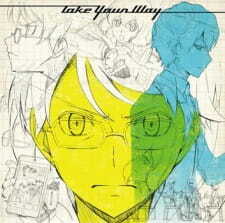 An animated music video for the song "Take Your Way" by livetune adding Fukase (from SEKAI NO OWARI). The song is also used as the opening theme for Devil Survivor 2 The Animation. Take Your Way is a pretty emotional music video. The MV tells the story of a boy who failed to save the one he loves, but is given another chance from a friend who offers his life in exchange. The song is told through the perspective of the one who sacrifices himself. The song's heartwarming lyrics about lifting the person one cares about to encourage them to try again, only this time they are not alone. kz's signature heartfelt lyrics and composing that tugs at one's heart-strings are all present and are enhanced by the narrative told through the visuals. The video plays with the nicely with the colors it assigns to its characters. The scene of the friend merging with the boy with the glasses and mixing their color coupled with the lyrics at that point about not being afraid and that he's never alone is handled wonderfully, followed by a great Itano circus with different colored missiles flying over the screen and leaving behind trails of onomatopoeia that was also done previously, but this time, resulting in a successful attempt at saving the girl and and a happy ending. Its empowering song about encouragement told from the perspective of a person who wanted nothing more than to see his friend succeed and the MV's distinct style of coloring and incorporating it in its narrative make Take Your Way a pretty great anime.